The 26th of May, The Hague Peace Projects was invited to speak at several school classes of the bilangual department of the Alfrink College in Zoetermeer, The Netherlands. The school organized a special project week about Conflict and Peace. Sylvestre Bwira and Jakob de Jonge gave a presentation of their work as an NGO that works for peace. Sylvestre told the students about his experiences as a human rights defender in Eastern Congo, a region torn apart by war since many decades. Also he gave his view on some of the causes of the conflict. According to him one of the big problems is the use of children and young people as fighters. In some areas the actual fighting is done by armies and militias containing as much as 80% children between the ages of 8 and 17 years old. Being poorly educated and easy to influence, they often believe they are fighting for a good cause. They have a lot of energy and aren’t always capable of judging what is right or wrong and this energy is often misused by people in high places to fight for them, says Bwira. They do not go to school and will grow up as irresponsible adults, incapable of taking care of the future of Congo. Another issue Bwira talked about is, what he calls, ‘the confiscation of truth’. There is a saying: “the first victim in any war is the truth“. This means that people in high places define what is true and what is not. Often denying obvious facts and legitimate alternative viewpoints, these people try to define their personal version of reality as the absolute truth. Therefore the education that students get in the Netherlands, is very important. Because it will learn students methods of how to do research and how to know what is really true and what are lies and propaganda. Establishing the truth about a conflict, answers to questions like ‘who are the real actors?’, ‘what are the reasons for conflict?’ and ‘who finances the war?‘ etc, is the first step towards peace. At some point one of the students asked Sylvestre: ‘if you had one minute to get your message to the whole world, what would you say?’ He replied: ‘I would say to everyone: disarm yourselves, let your feelings of anger go and start talking to each other’. Sylvestre cited Mandela, who said to the people who asked him to be the president of South Africa: ‘I will only be your leader if you stop using your weapons and accept that the only way forward is through discussion and dialogue‘. 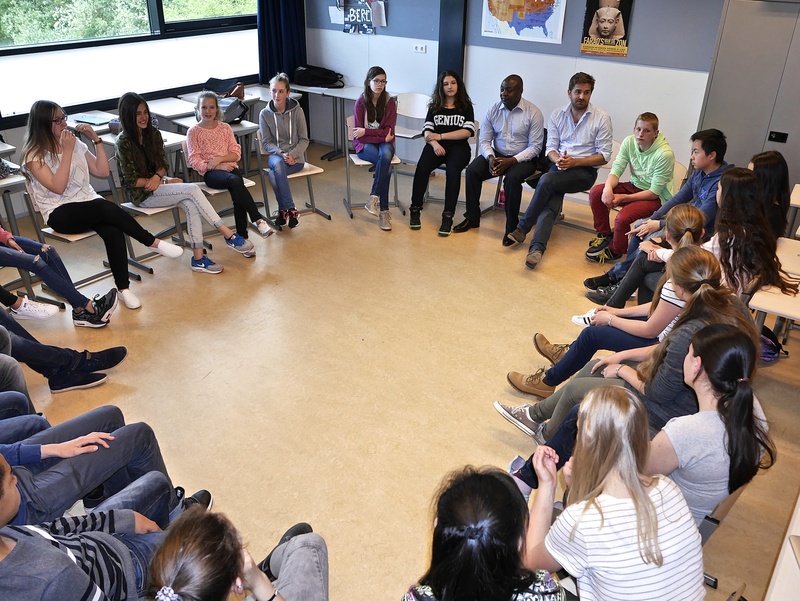 The Hague Peace Projects regularly gives lectures and lessons at schools and participates in discussions and debates and about the subject of conflict and peace-building. If your school or group is interested in a presentation, please contact us at: info@thehaguepeace.org.